Welcome to my page. I am on a mission to better health and wellness through primal low-carb/keto way of living. I started with Paleo and then migrated to AIP before finding what foods did and did not work for me. From this, note that since I bounce around between AIP, Paleo, Primal and Keto versions of all four, some of the recipes may not fit one guideline or the other, while others may meet a few. I will do my best to note which lifetyle each one is complaint with. I am currently workin on a post explaining the differences between each one. Hi, my name is Kara. Although there is an About Me page, I thought a front page welcome was in order so that I may properly introduce myself in a more personal level. I have been following a Paleo lifestyle since July 0f 2013, so I am just past my 3 year paleoverssary! While this has been a very challenging and cumbersome journey for me – sometimes taking one step forward and ten steps back, I always got back on the wagon and started again. I think it took me some time to accept the fact that this would have to be my lifestyle for the rest of my life if I wanted to live complete and happy. Pain free and happy trumps fibromyalgia, Sjogren‘s, Hashimoto’s and hidradenitis suppurativa any day! While I have come across may trials and tribulations, I have made a point to research, learn, experiment and discern. I am finally getting this and so, I am putting this page together – a bit at time to help others who are looking for answers and guidance on their journey as well. I have two children. Once is entering her Junior year of high school and is on the poms squad. I also have a 4-year old boy who has eczema bouts with an egg and peanut allergy. I am currently in a low transition to get him on a light AIP Paleo Protocol as well. I have also recently began a more structured fitness regimen that includes the use of a therapeutic peddler and started using a DeskCycle in September 2016 since I work a full-time job which requires sitting for most of my day. To counter the effects of the damage done by sitting, I have begun resistance training and high intensity interval training (HIRT and HIIT) and active stretch at home in the evenings. I will be adding routines and experiences to the site as well for those who are interested. 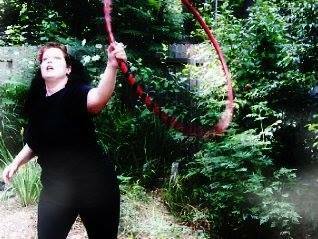 But for active fun, I love to hula hoop, jump rope, walk and roller skate! And since I am new to this and really just finding my way, I am always open to feedback, suggestions, requests and great conversation! Please join me. I would certainly love to have you! We can all learn from one another and enjoy this beautiful world together! I am going to love this site!!! Thank you! I certainly hope that you do! I found you through the Squirrel in the Kitchen blog and that blogs “Real Life Tips” section. The fact that you live just 45 minutes or so from me from me in SW really caught my eye!! I live in Pullman, MI just 10 miles inland from South Haven, MI over towards Allegan. I too have several autoimmune conditions; Hashimotos’ Throiditis, endometriosis (in my 20 & 30′ s) HS and osteoprosis. I was just doagnosed with Hashmotios in Nov. 2015. That is a LONG time to have autoimmune and not know it! I have recently completed my first year on AIP and have found that very helpful. Would you mind sharing what doctor(s) you see for your HS? I always get referred to a (conventional western medicine) deramatologist and have been twice and each time I leave in frustration and tears. They always want me to take accutane or antibiotics. To add insult to injury my insuance (BCBS) considers deramatologists “cosmetic” and does not cover the expense! GRRRR. I need a Functional Medicine (FMP) Dermatalogist and I am not sure if there are any. I have a wonderful FMP in Grandville I am happy to share info. if you are interested. Hi, Donna! I apologize for the delay in my response. Somehow your comment wasn’t alerted to me. That is amazing that we live so close! I am not from here but I love it here. I don’t see a doctor for HS, since I too, was always just handed a bottle of antibiotics. I simply avoid potatoes and dairy and that keeps the HS at bay. I don’t think many doctors are privy to the disorder, which is sad, because I know more people have it and don’t even know what it is. I spent a looooong time thinking I was riddled with staph that just wouldn’t budge.